Microsoft Windows is a complicated piece of software. It is the backbone of your PC, and when everything is working right, will disappear into the background as you work with your apps or games. When things aren’t working correctly, it makes you want to pull your hair out. Windows will attempt to scan and optimize things in the background to make the user experience more productive and enjoyable, but sometimes, these features will backfire and cause the end-user pain. If you are experiencing trouble with your Windows default Downloads folder, it may be very slow to open or often refuse to open at all. When you get a new PC or a fresh install of Windows on your PC, most folders are empty and navigating folders will feel incredibly snappy. You go online and, over time, begin downloading files, pictures, music, and more. By default, these items are saved to your user-specific Downloads folder. As the number of items in the folder grows, Windows will attempt to adjust how items in the folder are view in Windows Explorer based on what types of files are contained within. Many users will end up with a Downloads folder that has many images. Windows will try to help and begin to optimize this folder for pictures. This makes Windows scan the files in the folder and begin to generate thumbnail images for display in Windows Explorer. If, like most users, your Downloads folder contains all sorts of file types, the background scanning and optimizing can make accessing and working within this folder grind to a halt. Thankfully, there is a simple fix! To get your Downloads folder back up to top speed, simply find the folder in WIndows Explorer and right click on it. 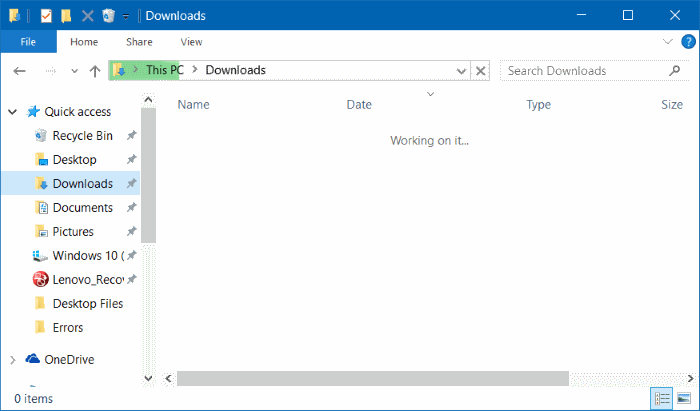 In Windows 10, the Downloads folder shortcut can be found under the ‘Quick Access’ listing on the top left side of Windows Explorer. From the right click pop-up menu, click on Properties. This will open the Downloads folder properties dialog box. Navigate to the tab labeled “Customize” at the top of the box. You will see a pull down selection toggle that asks what kind of folder you want. Use the pull down menu to select “General Items”. Make sure that you tick the box labeled “Also apply this template to all subfolders”. 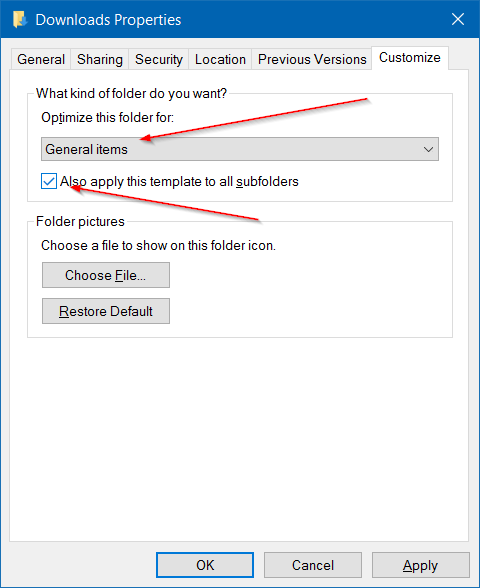 After this click “OK” to save this change and close the Downloads folder properties dialog box. Click the Start Menu button and restart your PC for these changes to take effect. Once you are logged back into Windows, you should notice that accessing and using your Downloads folder is now much quicker. Because the folder customization has been set to “General Items”, Windows no longer tries to scan and generate thumbnails for things like ZIP files or executables, reducing the strain on your PC and Windows services. For Windows 7 and 8 users, you may not be able to access the Downloads folder properties dialog box by right clicking on the Downloads folder shortcut. You will need to open Windows Explorer and navigate to “C:\Users\(your username)”. Within this folder, you will see the Downloads folder. You can right click this folder to get to the properties dialogue box and follow the same steps outlined above.